Valentine’s Day may be long over but this Moet Rose Valentine’s day gift box still stands out as a great promotional item. 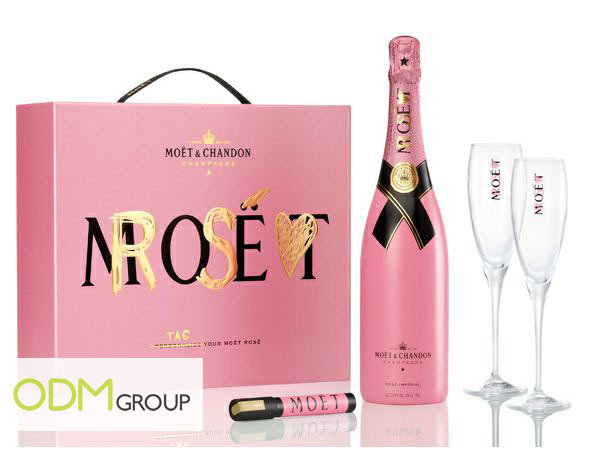 Its chic and baby pink packaging compliments the Moet Rose champagne bottle well. This Valentine’s Day gift box consists of 2 champagne glasses and a gold marker pen. The purpose of the latter is to allow users to write a message across the label on the bottle itself. This is a relatively fresh and interesting way to personalize your own champagne bottle. What we really love about Moet and their promotional gifts is that they always have their signature printed on their promotional gifts. In this instance, their champagne glasses have ‘Moet Rose’ prominently printed on it, which can enhance brand recall in the long run. We also love the graffiti concept Moet Rose has adopted for its products as it brings forth an image that despite it being a premium gift, it does not always need to have a classic look. Have you seen other interest concepts from champagne brands? Share your thoughts here! On the other hand, if you are looking for other types of promotional gifts, feel free to take a look at our Promo Gift Blog!